Pat Johnson started her professional career responsible for various aspects of learning programs within the Ministries of Health; Community, Aboriginal, and Women Issues; Forests; and Advanced Education Training and Technology. Pat was Director of Business Education and also Assistant Director of Learning & Development at BC Pension Corporation; and went to CRD as Manager, Workforce Development and Strategies. She has also trained with her own company internationally and within segments of the private sector. Her credentials include certifications in change management and transitions; Fierce Conversations; MBTI; Emotional Intelligence; World Class Speaker Coach; as well as extensive experience with the fields of coaching, communication and leadership. She is currently an ontological trained life coach in her own company, Pat Johnson & Associates, where she coaches individuals from various walks of life who aspire to achieve more in their life. She also works for Accomplishment Coaching out of San Diego as a Mentor Coach, working with coaches who are currently enrolled in the training program. In 2010/11, she served Toastmasters International, the fastest growing not-for-profit educational organization in the world, as their International President and Chairman of the Board – the only Canadian woman President in the organization’s 93 year history. As President, Pat oversaw some 300,000 active members from 116 countries and earned her reputation for inclusive, fair and honest leadership at the global level. She has a unique understanding of global leadership and experience standing on the world stage unafraid. A truly International leader and speaker, Pat has spoken in Australia, Caribbean, Germany, India, Ireland, Japan, Mainland China, Malaysia, Portugal, Singapore, South Africa, Sri Lanka, Taiwan, United Kingdom, and across the United States and Canada as both a keynote speaker and an educator. She continues to mentor a number of leaders worldwide. She has recently completed a 3.5 year term as Manager of 250 international consultants who advised on the development of new curriculum for an international educational organization; served on a number of advisory committees and chaired an international convention held in Vancouver during August 2017 where the global community came together. She co-chaired the inaugural post-convention Alaska Cruise from Vancouver to Hubbard Glacier. 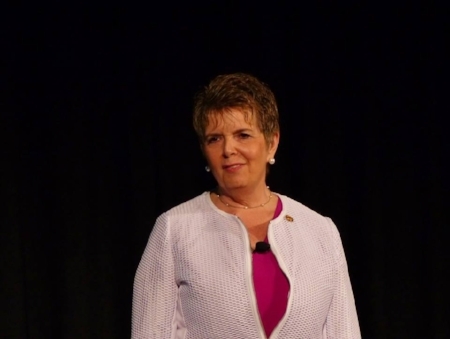 Pat recently published her first book entitled, “A Handbook for Building and Sustaining Vibrant Toastmasters Programs in Corporations” and was a keynote presenter at the International Convention in Chicago in August 2018. Within her local community, Pat has served as a Board Member with the Victoria Women’s Transition House Society and as a mentor for Leadership Victoria for five years. She served on an Advisory Board at UVic for Adult Education programs for several years and coached the Commonwealth Games Speakers’ Bureau. She is a past member of the Saanich Rotary Club where she was awarded the Paul Harris Fellow, is a current member of Toastmasters International and also curls out of the Victoria Curling Club.